FARGO, N.D.  After a two-and-a-half-hour rain delay, the Chicago Dogs finished off the Fargo-Moorhead RedHawks for a 7-0 win that spanned from Monday evening to the wee hours of Tuesday morning. Chicago scored three runs in the sixth inning after adding a run each in the first and third to start the games scoring. As the sixth inning finished, the tarp was pulled to start what would ultimately result in a weather delay of two hours and 28 minutes. The visitors scored a run each in the seventh and eighth after the game restarted to extend their lead even more. 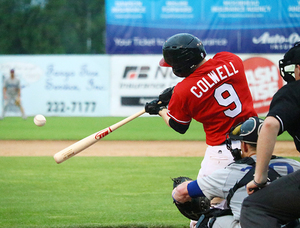 The Dogs seven runs on 16 hits were enough to best the RedHawks, who managed only four hits against Chicago starter Jared Carkuff and one more against the Dogs bullpen. Barker finished with five runs against on nine hits in 5.2 innings. He falls to 2-6 on the season. The RedHawks fall to 49-44 with the loss and remain four games behind the Gary SouthShore RailCats with seven games to play for both teams. Fargo-Moorhead will look to win the series with Chicago in the rubber game tomorrow night. First pitch is scheduled for 7:02 PM in the finale.